In a special Tuesday edition of The Bronx Pinstripes Show, WFAN’s Sweeny Murti joined the show to talk about the MLB off-season and Yankees topics. Murti works as the Yankees beat reporter for both WFAN and SNY, and also hosts the pregame and postgame shows for Yankees radio broadcasts. Sweeny has been covering the Yankees since 2001 and has joined the podcast in the past. Murti had some positive things to say about the Yankees, noting that he believes their roster has improved since the start of last season, especially the starting pitching. 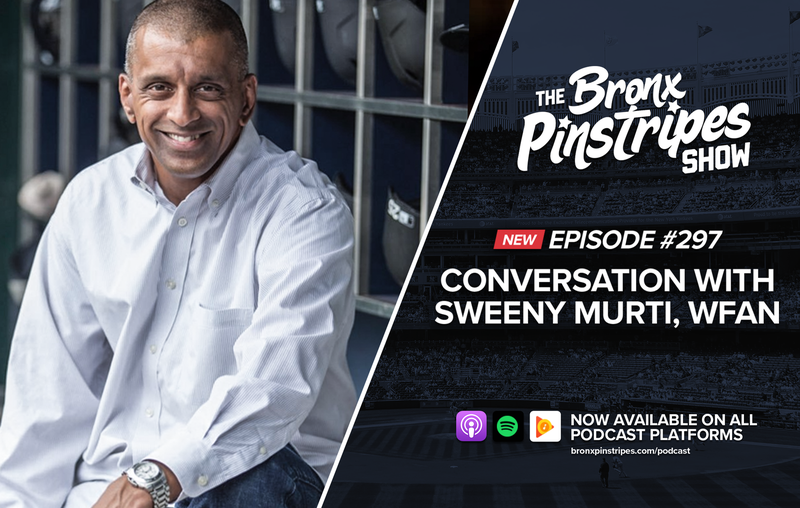 Sweeny Murti @YankeesWFAN joined the podcast today! Sweeny discusses if the #Yankees have done enough this off-season to improve their weaknesses and if Machado and Harper could still be added. “I think they’ve made improvements… They still have a really good bullpen, obviously. I think people are failing to put this in the proper perspective, but Happ and Paxton to start the season in the regular rotation is a lot different than what the Yankees had last year. So I think that you have to count that as a rotation upgrade,” said Murti. However, he also voiced his concern about the question marks surrounding the infield. Additionally, Murti discussed the Machado and Harper saga and the reasons why they aren’t signed yet. For Harper, Murti believes that he could be asking for a too much considering his inconsistencies over the past few years. You’ll have to go listen to hear what he said about Machado! With a lack of Yankees news the past few days, make sure to listen to the full episode of The Bronx Pinstripes Show for your mid-week Yankees fix.